Paper piecing is the next adventure on my quilting journey. I have made a few small projects some time ago with this technique and I was not really keen on it. But when I wanted to make a cushion cover with a unicorn block, there was no way around, but to start once more with paper piecing. The cushion cover is for Kate and I have used the same fabrics as for the previous cushion covers and the Magenta and Golden Flowers Quilt. The background fabric is magenta from the linen texture collection by Makower UK and the prints are diverse fabrics from Kaffe Fassett Collective. The pattern is from Unicornharts shop at Craftsy. I have quilted the unicorn cushion cover using the walking foot and Gutermann Sulky Cotton No. 30 thread in straight lines, both on the front as well as on the back. By the time I have made the unicorn paper pieced block I started to like this sewing technique and I got confident with it. So I knew that I shall continue with paper piecing. The next project was already on my list … – more in my next post. 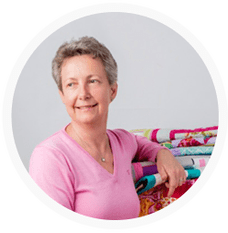 This entry was posted in blocks, cushion covers, paper piecing, patchwork, patterns, quilts, small projects and tagged block, Kaffe Fassett, quilting. Beatiful! I love the clever way you used the Kaffe Fasset floral print for the eye!